In Trident Warrior, all lines pay either from right to left or left to right. - Whenever any 3 or more " Scatters " occur, you may enter to Trident Warrior Bonus Game. - Trident Warrior Wild of symbols is substitutes for all symbols , except " Scatters" and " Trident Warrior " symbols. - " Long Fork " symbols will change to any another symbols to giving you best WIN , except Scatters and Tridents Warrior symbols. - Whenever 3 or more " Trident Warrior " occur, you will get free plays which is 5, 10 or 15. -Players may choose either LEFT or RIGHT to dodge the Shark Attack. At the end of each successfully avoid shark attacks that have earned rewards Bonus game. 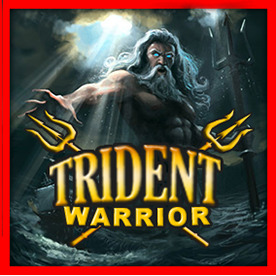 -Prizes Trident Warrior are multiplied by 15 times if the game was triggered by 5x "Scatters" . -Bonus Game ends when player failed to dodge the shark attack for more than 3 times. Is a card guessing game where player may compare their card ( BIG or SMALL) against the banker card, each won may get more multiply in the next game play level, with total of 5 multiply levels, which is x2, x4, x6, x8 and x10. Player may collect current win and return to the main game. All lines pay either from right to left or left to right.